I've never owned a zucchini plant so I've never had an adversarial relationship with the vegetable. 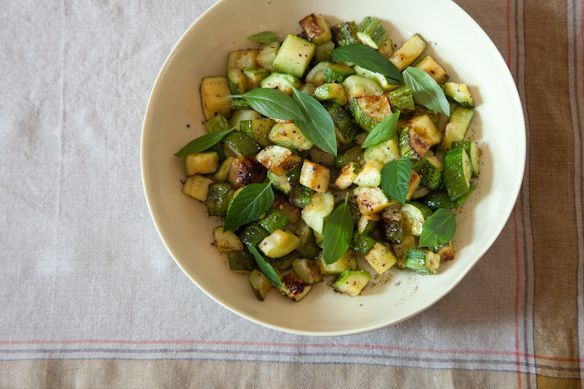 I'd happily eat zucchini all summer long. And I like a vegetable that holds both threat and promise. If you don't respect the zucchini, it will ruin your dinner, it will. It'll weep liquid and turn soggy. It'll be bitter if you don't watch out. But if you pamper this little garden diva, zucchini will return the favor and make a dish to remember. Now, before we get to the recipe, I have to confess: I screwed it up a little. Not in a bad way, just in a that's-not-what-I-meant-to-do way. You see, I had a terrific dish of deep-fried zucchini with mint and honey at Pies 'n Thighs in Williamsburg. I put the dish on my to-be-mimicked-at-home list, with a plan to skip the frying part and just focus on the splendid flavors of herbs and sweetness with zucchini. But then, when the time came, I forgot that Pies 'n Thighs had made a mint pesto, not mint leaves (see above for screw-up). Not that the whole leaf version is bad, it just lacks the herbal intensity of a pesto. So I leave it to you. You can go the easier, fewer-dishes route of tossing leaves on your cooked zucchini, or go the extra mile of making a pesto to spoon over top (see the last step in the recipe). Whatever you do, don't mess up the zucchini! Here's my not yet patented method. After cutting up the zucchini, you must salt it like you do eggplant. Zucchini contains just too much water for its own good. Best to remove as much as you can before it hits a hot pan. After letting it sit for 30 minutes, take the time to dry it off in a tea towel. Get in there and really dry it, like you're mopping off a dog after a bath. Then find a pan that holds heat well (aka nothing flimsy) and that can fit the zucchini in a single layer. Heat the pan over medium high heat, and once the zucchini goes in, see it as your job to regulate the heat so the zucchini is browning not burning, and is never steaming or stewing. It's a delicate balance but with a little effort, you'll get it right and your zucchini will thank you for it with crisp brown edges and pleasantly firm centers. Oh, and don't forget the honey -- the honey is the secret here. Slightly bitter zucchini likes a little sweet talk. another way.. and a use for your huge oversized zuccini. quarter a large one remove the seeds and grate them in a cuisinart sprinkle with salt and let them drain in a colander for a couple hours.Then take a big hand full and squeeze all the juice out of it. Put it in a low sided greased ( i use olive oil) dish with out changing the shape it should be a chunky mound.Sprinkle generously with grated romano cheese and a little olive oil. Bake it at 375 for about 30 minutes. It should still be a little crunchy. Don't over cook it. Love this! Made it last night - such a great combination of flavors! - and am bringing leftovers in for lunch with a few toasted pine nuts on top. Ok. I only just now happened upon this delicious sounding recipe for zucchini—after posting my mixed summer squash salad recipe. This one is getting prepared this weekend. Honey and zucchini? How creative is that? This dish looks delicious. I learned the hard way to be sure and salt the zucchini first and then soak up the water. It turned my first zucchini/squash galette soggy but the second one...just fine. Simple, sweet, and zucchini. Fabulous combination. I would NEVER have thought to use honey with zucchini....and I cannot wait to try it! Thanks, Amanda! Mmm, I'm thinking of using the pesto recipe (w/ honey and lime added) as a baste for grilling zucchini. I am beginning to be overrun with zucchini; this looks like a wonderful way to put it forth! I do something similar, except with a drizzle of fish sauce, which gives it crazy-good umami. I can eat it almost everyday.